Description: Ultimate Traffic provides Microsoft Flight Simulator 2002/2004 users the definitive answer to their AI Traffic needs. The project is a culmination of over a year of research and development, plus takes advantage of the latest AI technology in cooperation from our friends at Project AI. The goal of this project is to provide FS2002/2004 users with the most complete and realistic real-world airline movements worldwide and offer new levels in AI Traffic design. Cons: Can be a resource hog for those with very low end machines, other than that, not a thing. This has got to be one of the best payware products out there. (Next to the PMDG 737NG of course) Flight1 has outdone themselves on this piece of software. The rather large file (about 211MB) can be downloaded from the Flight1 website. From there you will have to enter your credit card number and other information and you will be able to install all of the files onto your computer with the automatic installer. Before you do anything else, I would reccomend backing up these files onto a CD, or somewhere else on your hard drive in case this information gets lost. Okay, so that this installed, you will have to open the UT main menu. From there you will be given the option on what you would like to install. I chose to install everything. Depending on your computer's speed, the file will take a few minutes to compile. Start up FS and go to ANY airport and you will see traffic. You get everything from the major airlines at large airports, to small bush services flying out of rural airfields in Alaska. There are also many utilites that come with this program. ou can even print out a timetable for your local airport to show you where each flight is going! There are MANY more features to this product that would take much more explaining here, but I do not have the time. All in all, this product is well worth the $30. There is so much you can do with this. So if you want very realistic traffic for FS, go and buy Ultimate Traffic now! Cons: flight models could have been better, like FSPainter. This product takes flight simulation traffic to a higher level. From the biggest airports like KLAX and KORD to the smallest in Africa and South America. Cons: Some models need improvement, not much though! 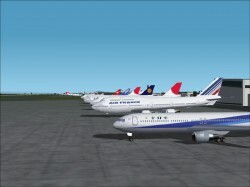 This product is a must have and should be listed at the top on a priority fs2004 payware list! It has just about every single airline in the world! Plus you get some gauges that allow you to see AI around you and which planes will be departing/landing at any airport! Amazing product! After hearing so much about this add-on, (after much research), I finally broke down and bought me a copy. WHOA! Why did I wait so long. This makes the sim truly as close to real as it gets. I'm still not really sure what all the options are (or even what it can do), the help not really that good (IMO), but that didn't stop me from firing it up. All I can say is WOW! I climbed in my Cessna at KSEA, called ATC to taxi, and while rolling on the taxiway, at least 40 other requests for taxi were requested. AND...with airlines and flight numbers I'm familiar with (Alaska Airlines mostly). Not to mention I was sixth in line for takeoff. How real is that? A GA airplane among the jumbos. Awesome. This is Certainly the best AI Traffic software you can get your hands on. with a simple installtion just choose the airlines you want and then hit compile and then run fs and watch your simming change. With various Updates from Flight 1, this product is a MUST BUY for those who are not satisfied with PAI and cannot wait for there Package to be released. Pros: real time flights with real airlines!!!! This add-on really makes the airports come to live. Lots of flights and airlines. Flights stick to a timetable e.g if thers a flight that goes every Wednesday at 11:56pm then it will only fly on the Wednesday at 11:56pm Now you can taxi to the runway behind aircraft and be followed by others. Includes a palmspotter for finding out which traffic is arriving and departing from the airport, this also has a voice which reads out when a flight is arriving or departing. It also has a TCAS. Great product! It has sooo many features like an aircraft painter, a flight status board, 2 wonderful gauges, and tons of flightplans and airlines! This product is great. It does exactly what it says, fills the sky with real-life airplanes and flights. What separates it out from free AI solutions like PAI are the automatic updater, and the UI end of the program that lets you find flights to fly, or lets you generate timetables, etc. What is also really great about UT is that it includes many tools for the tweakers out there who like to download or make their own traffic flightplans and repaints. Although the repaint selection from the updater is impressive, learning to add downloaded repaints from the PAI website is a must. It is very easy to do, however, once you learn how. The only real cons are that if you have a lot of traffic you can really drag your fps, making approaches to large airports impossible in some cases. The solution of course is to turn down the traffic density but then you are never satisfied because you want all the AI planes still . The other con is that you become addicted to finding repaints and also just plain planespotting. I usually planespot for like 15-30mins after I fly to an airport just because it is fun to see the AI world alive. Some more realistic cons are that while it does include a lot of tools, some extras are still needed (to get the full immersion of your new AI traffic) such as editvoicepack (freeware), which will add voice data to the ATC so that it will use the names of the new airlines you added with UT. In all a great product, never regretted the money I spent on it. It really makes FS come alive with AI traffic- and with great features like the timetables or flight browser plus automatic internet updates, it has real longevity as well. Supposedly they were planning on having a subscription service as well to download new sets of flightplans like every season or so. I don't know what the situation on that feature is- but if you want the latest flightplans, that would be a great way to keep up to date. This program is great. I like everything about it. It's a pretty huge file (211MB) so you can expect a lot. Well worth the money.